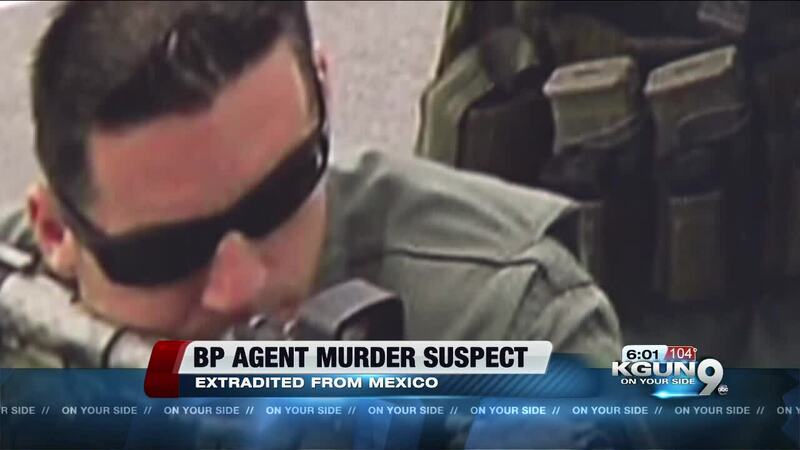 TUCSON, Ariz. - Border Patrol Agent Brian Terry was killed in a desert shootout in 2010. Now one of the last men accused of killing Agent Terry is back in the U.S. awaiting trial. Now in an early step in his path to trial, Heraclio Osorio-Arellanes appeared in Tucson Federal Court. It was nearly eight years after the shooting in the desert near Rio Rico that took the life of Border Patrol Agent Brian Terry. Terry had been part of an elite unit tracking a rip crew---border bandits who rob others in the smuggling trade. If convicted, Osorio-Arrellanes will not face the death penalty because Mexico will not extradite anyone who could face capital punishment. Federal prosecutors had to agree not to seek the death penalty so Mexico would release the suspect to the U.S. Seven men were indicted in all. Heraclio Osorio-Arrellanes extradition from Mexico leaves only one suspect left to face justice in the U.S. Jesus Rosario Favela Astorga is under arrest in Mexico, awaiting his extradition. Of the others charged in Agent Terry's death three pleaded guilty, juries found two others guilty. Their punishments range from 27 years in prison to life. One man, not at the shooting scene but part of the overall conspiracy was sentenced to eight years in prison. Another twist in the murder of Agent Terry was the discovery that two of the weapons used were connected to Operation Fast and Furious. In Fast and Furious, the U.S. Bureau of Alcohol Tobacco and Firearms allowed illegal gun sales with the idea of tracking the guns to the Mexican drug cartels. By one estimate they lost track of 14 hundred guns including the guns in the shootout that killed Brian Terry. The Fast and Furious revelations prompted the Terry family to sue the Federal Government. Family members accuse the government of continuing a Fast and Furious cover-up. Commenting on the latest extradition, Agent Terry's sister says, “Another step in the right direction. I would like to thank every agency in their role to make this possible. It’s a huge step in the right direction and I applaud the work they have done to make this happen. Let’s not forget we also have corruption, right here on American soil from those that orchestrated the entire Fast and Furious scandal that not only led to Brian’s murder, but took the lives of Jamie Zapata and countless others. These cowards worked hard to cover up this horrific program and we still have no answers to this day. Not one has been held accountable and it sickens me that they are able to go on with their lives. Osorio-Arrelanes has until August 24th to enter a plea in the case. His trial is set for September 11th.